Keylogging is a shortened form of “keystroke logging.” Keystroke refers to recording the keys pressed on the keyboard of a computer. Although not always, this technique is usually used for malicious purposes. The software used for the recording of keystrokes are called keyloggers. Since it is mostly used for malicious purposes, this calls for you to finds ways to protect yourself from keyloggers and their intent to destroy your computing experience. There are different types of keyloggers based on how they perform the recording of keyboard key presses. Let’s look into the types of keyloggers before moving further. Form-grabbing keyloggers are the most common ones because of their web-based nature. These keyloggers will grab the data which is input into a web form on any browser and will even work in a secure HTTPS-based connection. The browser does not know about the data theft, as the data is first copied by the keylogger and then passed over to the web browser. In this article, we will be specifically talking about the last category – form-grabbing keyloggers. If you are using a good Internet security suite, it should contain an anti-keylogger to warn you about keylogging being done on your browser or keyboard. Since Windows 8 includes a very basic antivirus, Windows Defender, most users don’t feel a need for a stronger security suite that may slow down their computers. For those that do, however, the following are three choices to help protect yourself from keyloggers. You can also download Windows 8.1 Preview which will offer better security and features to the users. You can upgrade to the latest Windows Update when a stable version becomes available through Windows Update. KeyScrambler is a wonderful free anti-keylogging software that can be used for protecting against web-based keyloggers. While you can have a complete Internet security suite for keeping yourself safe from most of the Internet threats, it does come with a cost. Most of the Internet security suites are not free and are prone to taking huge system resources while operating. 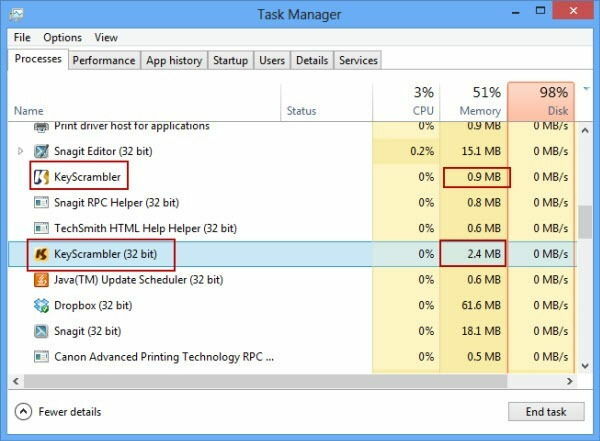 KeyScrambler resource usage is almost negligible. 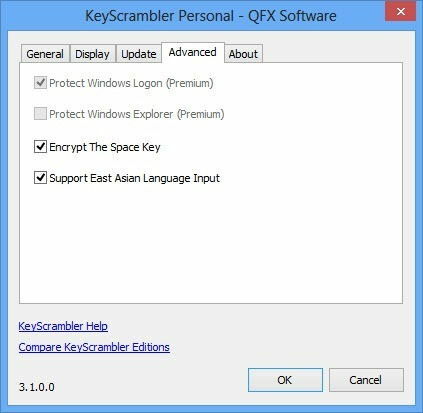 I have been using KeyScrambler for a few days and have yet to fall into any performance problems. There are two executables running in the Process Manager. Both of them take about three to four MB of memory with almost no processor usage. 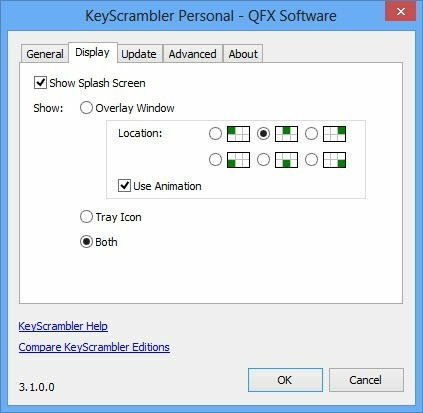 KeyScrambler can be downloaded from here. The installation procedure is quite simple and follows the standard app installation procedure on Windows. I like the way KeyScrambler handles the screen space. While the keyboard is being used on a web browser, it will show an overlay window on the top center of the screen, and when you finish writing, the window disappears saving space and time. The overlay window displays the encrypted version of text being typed by the keyboard. If a keylogger is active, it will get the encrypted form of keyboard key presses. If the overlay window is being shown, it is the confirmation that KeyScrambler is working and encrypting the keyboard presses. Right clicking on the system tray icon will allow you to enable or disable the KeyScrambler functionality. You can also use the default hotkey for this purpose which is Ctrl + Shift + K. The hotkey can be customized in Options under the General tab. You can also change the overlay window in Options under the Display tab. In the advanced Tab of Options, you can select whether to encrypt the Space key or not and supporting East Asian language input. 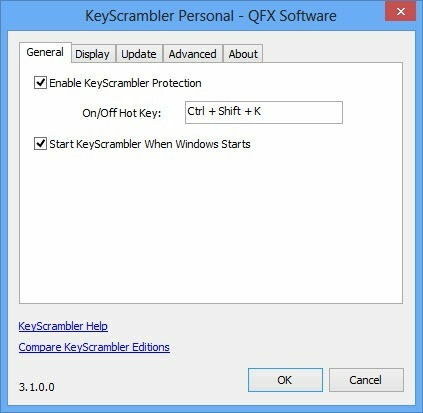 KeyScrambler encrypts the key strokes on a driver level, it becomes almost impossible for keyloggers to bypass KeyScrambler. The overlay window will show you the encrypted text while you are typing. The keyloggers will get the encrypted text which will be unreadable for anyone. I have been using KeyScrambler for some days and have been completely satisfied with it. It is unobstrusive and works seamlessly with all browsers. The only issue I had was using KeyScrambler along with KeePass, a password manager. If you are using auto typing feature of KeePass, the text typed into the text boxes will be encrypted by KeyScrambler, so you will need to manually copy the text fields from KeePass and paste them into the browser. Keylogger Beater – If you are using Firefox as your primary browser, you can install Keylogger Beater extension in Firefox in order to protect the form data from being logged. NextGen Antikeylogger is another software similar to KeyScrambler which can perform similar anti-keylogging operations with an exception that it does not seem to support Google Chrome. It is available for Internet Explorer, Firefox and Safari. How do you protect your computer from key-logging software? Share your thoughts with us in the comments. Next Article WhatsApp Vs Viber – The Best Phone Messaging App? Unfortunately the on-screen keyboard is as unsafe as typing on the hardware keyboard or using the clipboard. Writing a keylogger for these methods is extremely simple. How is Microsoft’s own on-screen keyboard? When there’s nothing else to work on, I usually use Microsoft on-screen keyboard which can also give a certain bit of security.. atleast better than typing on the keyboard directly from where the keyloggers will pick up the keystrokes. The question is how to detect that even a keylogger is actively running in the system?